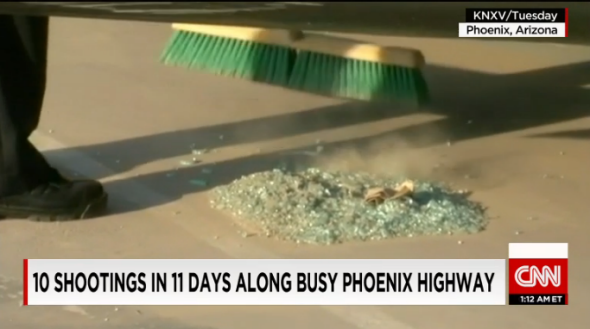 Phoenix highway shootings: I-10 freeway site of 11 incidents, none fatal, police say. Only one person, who sustained a light injury, has actually been hit. The first report Thursday morning came from a driver who spoke with DPS officers after his car window was shattered at 5:55 a.m., possibly by a BB gun, on the freeway near 83rd Avenue, officials said. A DPS spokesman said later Thursday morning that investigators were able to confirm the motorist’s report. There was no injury, DPS spokesman Bart Graves said. All the shootings over the past two weeks came in one eight-block stretch. But they weren’t all identical. “I think we have a number of different weapons involved, but we’re still trying to determine that,” Milstead said. The first confirmed shooting took place on Aug. 29.